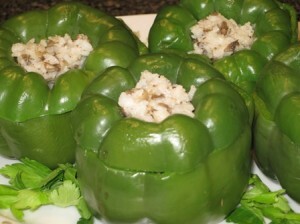 Green Peppers are one of those vegetables that taste great raw, or cooked. I like all color peppers, green, red, orange, yellow, as a raw vegetable used in salads, or with dips. I also would like to share this recipe for peppers served hot, as a main course, or as a side dish. Peppers, like cabbage rolls, may be stuffed with meat, or vegetable stuffing, so I selected the rice/mushroom stuffing for this recipe. Rinse the peppers under warm running water. Cut a slice from a stem end of each pepper (about ½ inch thick). Place the peppers, and the tops, into the boiling water and cook for 5 minutes. Remove peppers and cool off in cold water. Sauté chopped onions in canola oil to a golden color. Add mushrooms and garlic, and sauté for 3 minutes. Mix the rice and mushrooms, and season with Italian seasoning, salt and pepper, to taste. Fill the peppers with the rice filling. Place the pepper top slices over the filling. Pour ¼ cup of vegetable broth into each pepper, and pour the remaining broth into the pan. Bake uncovered, at 350 degrees F, for 30 minutes. If you prefer to stuff peppers with other vegetables, rather than mushrooms, then you might want to use tomato juice in place of the vegetable broth, to enhance the flavor. I personally do not like the combination of tomato juice and mushrooms/rice filling. *ground turkey that is! oops! Diana, you are such a sweetie! Thank you for taking your time visiting my site and leaving such positive comments. I agree, ground turkey is such a great substitute for other meats, in so many recipes. Soooo…..your fiance cooks…..wonderful trait in a man….you are a smart gal! How are those wedding plans going for you both? If this one appeals to you, then you would definitely like the red peppers stuffed with Bulgar, but you would need to omit the turkey meat, if you are interested in vegetarian version. I am caregiving to my father who is 85. He decided at 85 to go vegetarian. So know I’m looking up recipes. Found this one, made it for 2 people, and he loved it. Thanks so much. I am so happy to hear that he liked this dish. I think older people prefer vegetarian meals and soups, because these are easier to digest and have more fiber to keep the regular. I also heard that older people like sweets, because their taste buds are not as sharp as they used to be, and sweets are pleasant in taste to them. Please visit my other vegetarian and soup recipes, and I am sure your father will like them as well. Your father is a very lucky person, since you are so kind to take care of him. Thank you for reading my post, and taking the time to leave a comment.